Center field at Yankee Stadium is hallowed ground. Once upon a time, Joe DiMaggio and Mickey Mantle patrolled this section of the House That Ruth Built. Now, granted, Bernie Williams — whose 16-season New York Yankees career lasted from 1991 to 2006 — may at best be a borderline Cooperstown inductee, but he is a more-than-worthy successor to Joe D. and The Mick as a center fielder par excellence. Plus, as was the case with his two predecessors, the Bronx Bombers were his only major-league team. It is understandable, then, that “Bern Baby Bern” predates “Feel the Bern” as a catchphrase among fans of another celebrated Bernie: Senator Bernie Sanders, the 2016 presidential hopeful. Williams grew to be a 6-foot-2, 205-pounder. He was just 16 when, in 1985, New York Yankees scout Roberto Rivera noticed him and wished to sign him. The youngster was dispatched to a baseball training camp in Connecticut, and was inked by the team on his 17th birthday. As he began his minor-league career, he attended the University of Puerto Rico; at this juncture his intention was to earn a degree in biology and, perhaps, also take pre-med classes. But he decided to focus on baseball, realizing that his studies could impede his rise within the Yankees system. Williams’s first minor-league season came in 1986, when he was assigned to the Gulf Coast League Yankees, the team’s Rookie League affiliate; he appeared in 61 games, hit a respectable .270 with 2 home runs and 25 RBIs, and was selected to the league’s All-Star team. At the time he was strictly a right-handed hitter and speed still was a part of his game, as he pilfered 33 bases. Then in 1987, Williams split the season between Fort Lauderdale in the Class-A Florida State League (where he hit .155 in 25 games) and Short Season-A Oneonta in the New York-Penn League (where he improved to .344, also in 25 games). On November 8 he was added to the Yankees’ 40-man roster. The budding big leaguer spent the entire 1990 season at Albany-Colonie, where he made it into 134 games and hit .281 with 8 home runs and 54 RBIs while leading the league with 98 walks and 39 stolen bases. His prospect status was on the rise: He was named an Eastern League and Baseball America Double-A All-Star and was cited by Baseball America as the second-best Eastern League prospect. Also, while in the minors, he began using both hands while playing Wiffle ball with a sibling. In so doing, he realized that he could effectively hit left-handed; he queried Buck Showalter, his manager at both Fort Lauderdale and Albany-Colonie, to win the okay to practice switch hitting — and so he began coming to bat for the first time from the left side of the plate. During the following two campaigns, Williams further established himself at Columbus, respectively hitting .294 in 78 games and .306 in 95 games. Baseball-Reference.com lists conflicting figures for his career minor-league batting average, home-run total, and total number of games; representative numbers are .285, 48, and 660. Nonetheless, two months into the 1991 season, he was primed for his big-league bow. “Clearly, there are (Clippers) players ready for promotion,” wrote the New York Times’ Michael Martinez on June 11. One of them was Bernie Williams. “He’s got all the tools,” observed Clete Boyer, a Columbus coach. “When he gets up there, he should stay.”4 What surely was the season’s highlight for Williams was his major-league debut, which came on July 7 against the Baltimore Orioles. Replacing the injured Roberto Kelly, he was the starting center fielder, batting eighth and going 1-for-3 with a sacrifice fly and two RBIs in a 5-3 loss. “It’s very different,” Williams declared of playing before 43,505 fans in the Bronx ballyard. “I’ve been dreaming of this since I signed six years ago.” He said he “was nervous out there at first. I didn’t expect this many fans.”5 Williams’s first big-league hit was a ninth-inning single off Greg Olson, and his initial home run came seven days later against California’s Chuck Finley. Prior to his call-up, Williams had been named to the Triple-A All-Star team, but his promotion prevented him from appearing. He was the Bronx Bombers’ starting center fielder for the remainder of the season, playing in 85 games and batting .238 with 3 home runs and 34 RBIs. His big-league high point was a five-hit game against the Cleveland Indians on October 5. 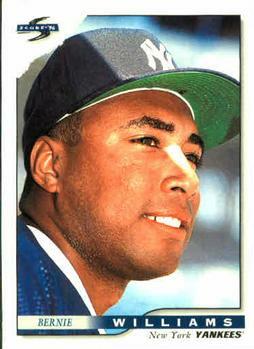 The 1993 campaign was extra-special for Williams: His minor-league apprenticeship was completed, and he spent the entire season with the Yankees as the starting center fielder. However, a slow start resulted in George Steinbrenner, the easily exasperated Yankees owner, putting pressure on general manager Gene Michael to trade Williams. Rumor had it that he would be swapped for Larry Walker of the Montreal Expos, but the deal was not consummated.8 For the season, Williams appeared in 139 games — a muscle strain in his rib cage sidelined him for 23 games between May 13 and June 7 — and he hit a respectable if unspectacular .268, with 12 home runs and 68 RBIs. He was the team’s leadoff hitter through the All-Star break; from then on, he mostly batted sixth. His season high points included his smashing his first grand slam on June 14 off the Boston Red Sox’ Danny Darwin — the Yankees won the game 4-0 — and hitting in 21 straight games between August 1 and August 23. The following season, Williams’ batting average improved to .289 (with 12 home runs and 57 RBIs) in 108 games. He returned to the leadoff spot for 28 games, during which he hit .362, but also batted sixth, seventh, and eighth. This success may be contrasted to his .178 average for the month of April. His top performances that year included hitting homers in three consecutive games between June 6 and June 8; on June 6, he enjoyed his initial two-homer game (against the Texas Rangers), in which he drove in seven runs. On that occasion, he joined Mickey Mantle, Roy White, Tom Tresh, and Roy Smalley as the fifth Yankee to homer from both sides of the plate in the same game. Then in 1995, Williams established himself as an upper-echelon big leaguer, appearing in 144 games and hitting .307 (with 18 home runs and 82 RBIs). Yet again, he started off slowly; for the first two months of the season, he hit .204 with 4 homers and 14 RBIs, but hit .333 for the rest of the season (and .354 during the month of August). While he stole eight bases — he and Pat Kelly trailed only Luis Polonia, who pilfered 10 — by now it was clear that he was no big-league basestealer. However, while the Yankees were shut down by the Seattle Mariners in the American League Division Series, Williams’s postseason debut was a stellar one; in five games he hit .429 with two homers and five RBIs. In 1996 Williams proved that the numbers he compiled during the previous campaign were no aberration. He played in 143 games, hitting .305 and establishing what then were career zeniths with 29 home runs and 102 RBIs. His accomplishments that season included three two-home-run games and eight RBIs in a 12-3 triumph against the Detroit Tigers on September 12. He improved on his 1995 postseason performance, hitting .471 with 5 home runs and 11 RBIs in the ALDS and American League Championship Series. While he was the ALCS MVP, his numbers sank in the World Series against the Atlanta Braves; he hit just .167 with a single home run and four RBIs. But no other Yankee matched his RBI total and his home run in the eighth inning of Game Three helped win the game — and allow the Yankees their first world championship since 1978. Williams’ all-time best season came in 1999, when he hit .342 in 158 games –third in the AL batting race — while belting 25 home runs and driving in 115 runs. His 202 hits then were a career high, as were his number of games played and RBI total along with his 116 runs and 100 walks. His seven four-hit games were tops in the majors, with two coming against Tampa Bay on June 22 and June 23; yet again, he made his league’s All-Star team, and his status as a feared hitter was demonstrated by his being intentionally walked three times in a game against Tampa Bay on September 26. In the postseason, he hit .273 with two home runs and eight RBIs; in the first ALDS game against Texas, he went 3-for-5 with six RBIs. However, most impressive of all, Williams’s elite Yankee status was illustrated by his joining Lou Gehrig, Babe Ruth, Joe DiMaggio, and Mickey Mantle as the only Bronx Bombers to drive in at least 100 RBIs and score at least 100 runs in three separate seasons. He and Derek Jeter became the first Yankees with at least 200 hits in the same season since Gehrig and DiMaggio in 1937. Williams followed up in 2000 by hitting .307 in 141 games and setting career zeniths with 30 home runs and 121 RBIs. He earned the most All-Star Game votes of any American League flychaser; perhaps his best games of the season came on April 23, when he went 3-for-4 with two homers (one lefty and one righty) and five RBIs, and June 17, when he was 4-for-4 with seven RBIs. However, he sat out seven games, starting on August 19, with a right rib cage strain. In the three postseason series, against Oakland, Seattle, and the Mets, Williams hit a respectable .279 with two home runs and five RBIs. Then in 2002, Williams appeared in 154 games and finished third in the AL batting race with a .333 average. He hit 19 home runs and drove in 102 runs; his 204 hits were a career high, and he was 5-for-15 in four postseason games. But this was his final season as a .300 hitter. His average sank to .263 in 2003; he appeared in 119 games, hitting 15 home runs and driving in 64 runs. Still, his name was increasingly appearing on team career stat lists. His 1,950 total hits ranked eighth all-time in Yankees annals; his 241 homers were seventh; his 1,062 RBIs ranked ninth; his 372 doubles ranked fifth. He got his 1,000th RBI on April 2, doubling against the Blue Jays. There were downs in 2003: On May 23 he landed on the 15-day disabled list with a torn medial meniscus in his left knee, for which he underwent arthroscopic surgery. But there were ups: He hit .318 in 17 postseason games; his 19th postseason home run, belted in Game Three of the World Series, was the all-time major-league high, exceeding Reggie Jackson and Mickey Mantle; and his 66 postseason RBIs broke the record of 63 held by David Justice. The 2004 campaign had Williams hitting .262 in 148 games, with 22 home runs and 70 RBIs. His injuries and illnesses were mounting; he failed to accompany the team to its opening series in Japan, as he was felled by appendicitis. However, on June 10, he became the seventh Yankee to reach the 2,000-hit plateau when he singled against Colorado. Six days later he hit his 250th career home run. And on August 6, he doubled for the 390th time in his career, besting Joe DiMaggio’s 389 and taking over fourth place on the all-time Yankee list. Two days later he smashed his 10th grand slam, topping the nine hit by Mickey Mantle and Yogi Berra. He now ranked fourth among all Yankees in this category, behind only Lou Gehrig (with 23 grand slams), DiMaggio (13), and Babe Ruth (12). And he enjoyed a solid postseason, hitting .296 with 3 home runs and 13 RBIs. Then, in 2005 — the final year of his eight-year contract — Williams’s batting average sank to .249. In 141 games, he hit 12 home runs and drove in 64 runs. But he was just the 10th Yankee to don pinstripes for 15 seasons; in a game against Baltimore on September 27, his 2,215th hit bested DiMaggio’s total and elevated him to fourth place on the team’s all-time list. Notwithstanding, the Yankees announced on August 2 that they would not pick up Williams’s option for the following season, preferring a $3.5 million buyout. “It’s a formality,” Williams declared at the time. “I don’t think it means I’m going to be a Yankee or not going to be a Yankee. They can still talk to me when the end of the year comes.”14 That December Brian Cashman, the team’s general manager, re-signed Williams to a one-season, $1.5 million contract. He put up respectable numbers in 2006, playing in 131 games and hitting .281 with 12 home runs and 61 RBIs. On July 26 his career hit total reached 2,300; on August 16 his 443rd double ranked him second on the all-time team list. That year he also played for his Puerto Rican homeland in the World Baseball Classic. But 2006 was Williams’s final major-league season. He wished to return in 2007 and even was willing to be a backup outfielder and occasional pinch-hitter, but he was offered only a minor-league contract with the opportunity to come to spring training and compete for a roster spot. He refused the invitation. Even though Williams was unwilling to sign with another major-league team for 2007, the 38-year-old ballplayer refused to officially retire. The following year, he played for Gigantes de Carolina in the Puerto Rico Baseball League, hoping that this would lead to a roster spot on the team that would represent his country in the 2009 World Baseball Classic. “I have as good a chance as anybody to make that team,” he declared. “A lot of good players out there, so it’s gonna be hard to try and make that team. But I like my chances. They’re probably as good as anybody else’s.”16And so he arrived at the Yankees’ 2009 spring-training camp to work out, eager to play in the Classic — and perhaps be one of the 25 Bronx Bombers to head north at the start of the season. “After doing this for 16 or 17 years, you get some of that baseball thing back in your system,” he noted. “It’s like, ‘Whoa, maybe I can do this for a couple more years.’ I guess that’s part of the fantasy that I try not to allow myself to live.”17 But of course, his big-league career was finished. As an ex-big leaguer, Bernie Williams has not rested on his on-field accomplishments. Early on, his talents as a classical guitarist rivaled his athletic ability. At age 8, he became enamored of the flamenco guitar music his father played for him. Five years later he began attending San Juan’s Escuela Libre de Musica high school, a private performing-arts institution. Even after signing his pro contract, he regularly played his guitar as a form of relaxation, often in his team’s clubhouse. Williams of course was into baseball, but he evolved across time into an acclaimed guitarist. He was inspired by a range of musical styles (including jazz, classical, pop, Brazilian, and Latin), and became adept at both acoustic and electric guitar. His debut album, the jazz-rock-tropical music-influenced The Journey Within, was released in 2003. On it, he plays lead and rhythm guitar and also penned seven of the album’s 12 numbers; among them are “La Salsa En Mi” and “Desvelado,” which link his affection for jazz and his Puerto Rican roots. He is joined here by a first-rate group of musicians, including Béla Fleck, Kenny Aronoff, Shawn Pelton, Luis Conte, Leland Sklar, Tim Pierce, and David Sancious. The Journey Within made it to number 3 on Billboard’s Contemporary Jazz Chart. Then in 2009 came a second album, Moving Forward, which debuted at number 2 on the Contemporary Jazz Chart, and for which he earned a Grammy nomination. Here, his collaborators include Bruce Springsteen, Jon Secada, Dave Koz, and Patty Scialfa. Two years later, he co-authored the appropriately titled book Rhythms of the Game: The Link Between Music and Athletic Performance. He has over the years performed on countless occasions in numerous venues. One example: In 2014, he played “Take Me Out to the Ball Game” on the field in Fenway Park in a pregame ceremony before Derek Jeter’s final big-league appearance. 1 Mitchell Stephens, “Bernie Williams: On Westchester, His Music and, Oh Yeah, the Yankees,” Westchester Magazine, July 2003. 2 Michael Martinez. “Spring Phenom a Yankee Perennial,” New York Times, February 26, 1989: S3. 4 Michael Martinez, “Looking Up While Down on Yanks’ Farm,” New York Times, June 11, 1991: B11. 5 Filip Bondy, “Another in Columbus Crew Gets to Discover Stadium,” New York Times, July 8, 1991: C6. 9 Joel Sherman, Birth of a Dynasty: Behind the Pinstripes With the 1996 Yankees (Emmaus, Pennsylvania: Rodale Inc., 2006), 242-243. 10 Murray Chass, “Baseball; Williams, Nearly a Tiger, Is Still a Yankee for Now,” New York Times, November 20, 1997: C3. 11 George King, “Survivor in Pinstripes: Yanks Were Smart Not Trading Bernie Williams,” New York Post, February 24, 2002: 92. 12 Buster Olney, “Yankees Capitulate, Keeping Williams in $87.5 Million Pact,” New York Times, November 26, 1998: A1. 13 Jack Curry, “Williams’s Father Dies of a Heart Attack,” New York Times, May 15, 2001: D4. 14 “The Yankees Decline an Option on Williams,” New York Times, August 3, 2005: D3. 16 Christian Red, “Former Yankee Bernie Williams Burns for One More Shot at Plate, While Adding to His Musical Legacy,” New York Daily News, January 18, 2009. 17 Jack Curry, “Williams Casts Look Toward the Majors,” New York Times, March 4, 2009: B14. 20 Joel Sherman, 242, 244. 22 Ken Davidoff, “How Bernie Williams Blended in for 4 Years of Music School,” New York Post, May 12, 2016. 23 Evan Grossman, “Bernie Williams Hits the Right Notes With Classmates as former Yankees Star Nears Graduation From Manhattan School of Music,” New York Daily News, May 12, 2016.